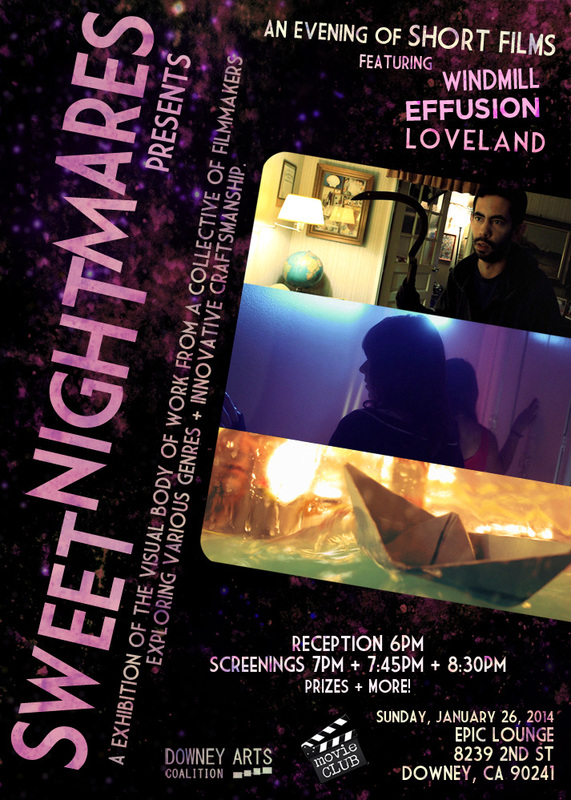 Local filmmaking team Sweet Nightmares showcases their body of work created within the 2013 year in a special free screening event taking place at The Epic Lounge Sunday, January 26th starting at 6pm. The evening features a trio of short films spanning from dark, psychological territory to psycho-sexual thriller & whimsical romance. The innovative filmmakers mold various genres with a heavy hand in shoe-string budget creative craftsmanship. The films include WINDMILL, EFFUSION & their latest efforts, LOVELAND. Coming to you in conjunction with our monthly Movie Club, the event features props from the films, posters, merchandise, raffles, prizes & eye candy galore. Meet the team in person, interact with the cast members & experience succulent cinema.